Similar in concept with the Ext Grid only its pure jQuery love, which makes it light weight and follows the jQuery mantra of running with the least amount of configuration. 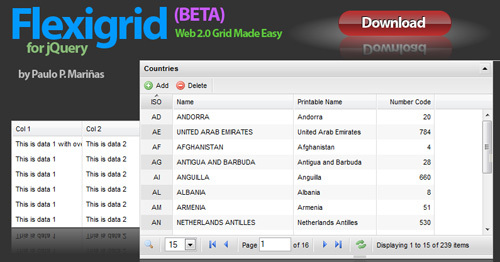 New $().flexAddData method, allows you to directly add new data to the grid using your own data source. New preProcess API, allows you to modify or process data sent by server before passing it to Flexigrid, allowing you to use your own JSON format for example. I’m planning to add an Editable and Resortable rows feature, as well as other cool GUI features. One of my main goal for the plugin is ultimately to keep it lightweight, maybe under 20k when compressed. Because otherwise you should probably stick with Ext Grid or YUI data table. Free Flash mp3 player for your website, supports Artists & Albums, Full XML Customzeable. Yahoo! Introduce Web Analytics – Highly Customizable & Powerful Tool.